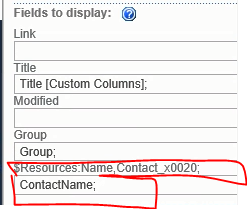 I have a person or Group field called ContactName but I can't get it to display "Name"(FirstName and LastName). The Group column and modified columns works perfectly but not the person or group field. I'm sure i'm missing something. Is my OuterTemplate correct? Browse other questions tagged content-query-web-part or ask your own question. content query webpart, query filter on a hidden field?